Sometimes I look around at the world we live in and want to grab my children and run away. We could build ourselves a fortress in the middle of nowhere. Safe. Protected. Sheltered. But then something happens and I’m reminded of the overwhelming beauty and love of people. And I want to be out in the world even more. 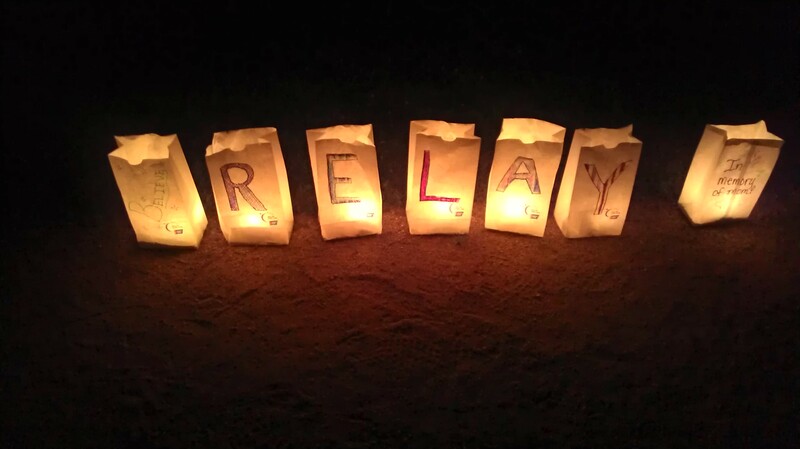 This weekend I walked in the Fair Oaks Relay for Life on the beautiful Sacramento Waldorf campus. Someone was walking from 9 a.m. Saturday to 9 a.m. Sunday. I can’t tell you how many laps I did on that track. I could barely walk the next day. But it was more than just walking. A woman who survived breast cancer wore a satin purple prom dress, purple dish gloves and leopard pants. Life radiated from her. A mother, a survivor with a purple shirt, told me that her teenage son helped her through everything. He shyly smiled and grabbed her hand. White bags decorated with the names of people who had lost the battle with cancer lined the track and gleamed love. My children, filled with the excitement of life, darted in and out of the bags around and around the track. Understanding and compassion filled my sons face as a woman read the story of a fairytale princess battling the dragon cancer. 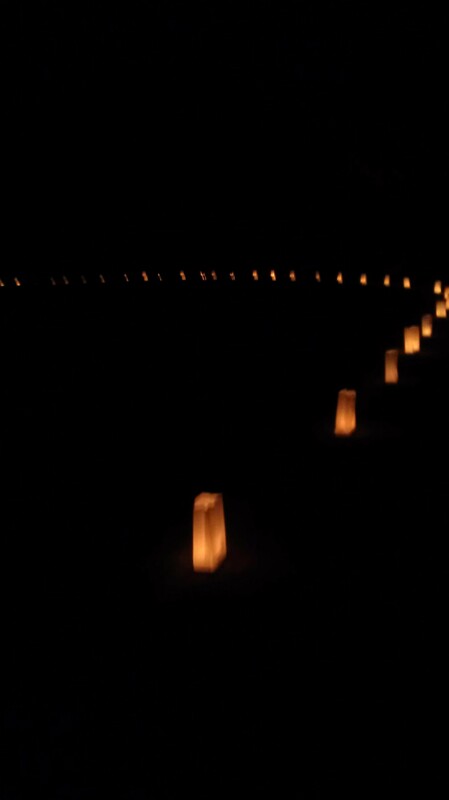 After sunset the luminaries were lit and I carried my sleepy girl in my arms around the track. I could feel her warmth and life on my body as she kept kissing my neck softly. A dear friend walked all night, limping and cold, but found inspiration from the messages on those simple bags and just kept putting one foot in front of the other. My mom and I walked together around the track as the sun rose above the treetops, grateful to have each other. As I walked around the track my feet ached and screamed at me, and I felt angry that I’ve let my body get this out of shape. But I kept moving, because I’m here and I can walk. Teenagers joined together to walk in honor of their principal that died of brain cancer. A woman shared her story of surgeries, fighting through pain, tubes coming out of her, her husband shaving his head to match hers, the hope and love she found. All these people came together to celebrate life, remember lost love ones and raise money to fight back. I’m still filled with so much emotion and awe. I often live in a place full of self-doubt, guilt, worry and fear. I’ve allowed these things to rule me. Strength. Power. Endurance. Love. Hope. That’s where I want to live. Will you join me? I feel all those things, When I went back to work yesterday I was filled with a light of joy, sadness so many feelings. I wanted to shout out to everyone to hold all your family and friend close because that dragon is lurking around every corner. I want to touch everyone I meet so they know how much I love them. I might not have lots of money but I have lots of hugs and kisses, respect, kindness, understanding, I think the self doubt, guilt, worry and fear is passing with every great happy joyous moment we are around those who love and understand us. My goodness. The world IS full of beauty. Even when it’s hard to see beyond all the ugly, hatred and sad. You are such a beautiful human being, Bridgette! Never forget that!